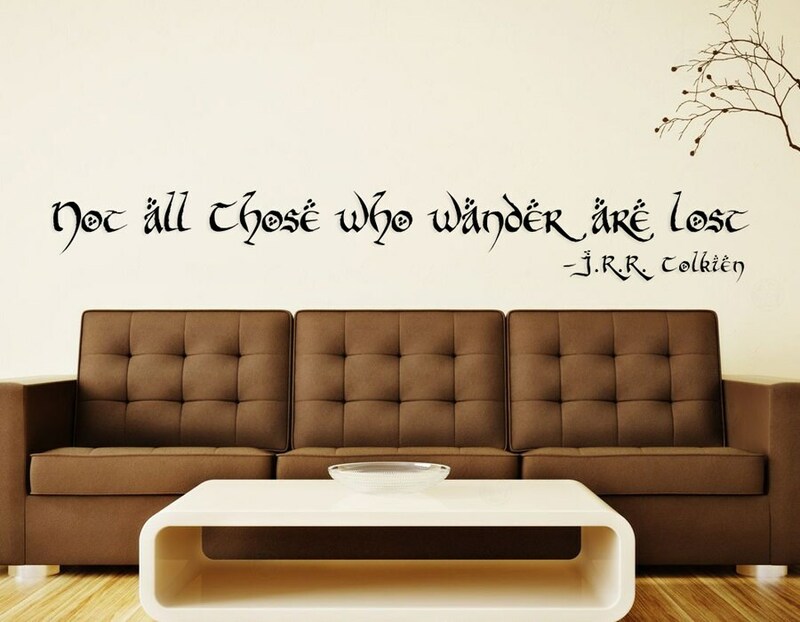 This premium quality removable vinyl wall decal features the J.R.R. Tolkien quote "Not all those who wander are lost" in a tolkienesque calligraphy font. - 36" wide x 4.50" tall. - 48" wide x 6.00" tall. - 60" wide x 7.50" tall. - Ready to apply with easy to follow instructions. - Precision cut from the highest quality removable wall vinyl available. - Removes very clean when you are ready for a change, leaving no residue & will not harm your walls. - The vinyl has a beautiful matte finish & looks as if it was actually painted on your wall. - There is no background to the decal. The background color will be the same color as the wall you place it on. - Adheres to smooth or slightly textured clean wall surfaces. - Two piece decal for custom placement. - Super easy to align pieces. - Ships rolled inside a heavy duty mailing tube. - 100% Made in the USA. - Crafted by The Dagobah. Never applied a wall decal before? No worries, we include small decals in every order so you can practice the installation technique. LOVE IT LOVE IT LOVE IT!!!! Looks awesome. First time I do something like this so it did take me a while, but when it was finished, it looks stunning! THANK YOU!!! Shipped earlier than expected too! Top top top quality. Looks amazing in the room. We love PayPal. It's fast, easy and safe for all of us. We also accept credit cards. If you're not happy with a product send it back within 14 days and we will refund your purchase with no hassles. After 14 days we will issue you shop credits. Items must be returned in brand new condition. You can exchange products 14 days from delivery date and extended to 30 days for holiday time. Items must be returned in brand new condition. We stand behind all of our products 100%. If you have a defective product just let us know , we will take care of it and do our best to put a smile back on your face. We ship all US orders via USPS first class package with an option to upgrade to USPS priority. All International orders ship via USPS first class international package.